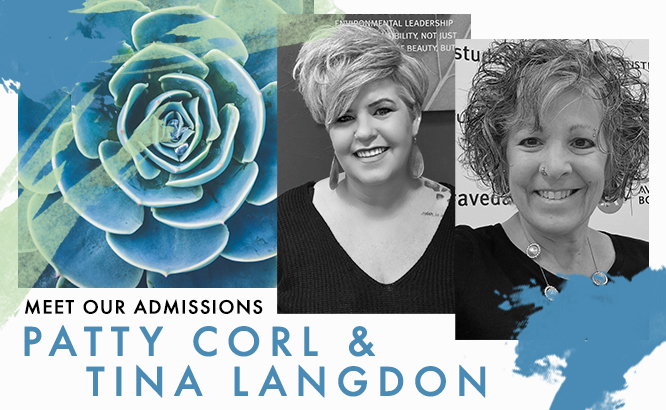 Anyone who has recently attended Aveda Institute Idaho, located in Boise and Twin Falls, would know one of our two incredibly talented admissions staff. Patricia “Patty” Corl is the campus director for our Boise campus, and Tina Langdon is the campus director in Twin Falls. These two women are tasked with many responsibilities, one of which is to help future students become acquainted with the school and their financial aid* options. Each of them bring different experience and expertise to help students along their journey, and we appreciate the difference they make! Director of Aveda Institute Boise, Patty Corl, is one of the most seasoned members of the family. She helped the owner open the original school and was brought on to be a director. Patty brings with her over 35 years of experience as a licensed cosmetology instructor, making her one of the most qualified people in the entire school. She even owned a spa in Philadelphia for over 20 years! Patty’s favorite part of her job is education. Her role is to help future students to feel strong, confident, and highly-educated, and she takes her job very seriously. When a student or prospective student comes to meet with her, she doesn’t want them to leave unsure of themselves. She wants students to be confident and ready to tackle their careers head-on! It’s common for future students and their parents to come to the school with many questions and uncertainties. For example, many people are nervous about the financial aid process because it can seem complicated or overwhelming. Patty’s job is to simplify the process so that any student can come through her door and apply for as many financial aid opportunities as they can. Having someone like Patty to help you through the financial aid process makes it much easier to get the funding you need to pursue your dream! 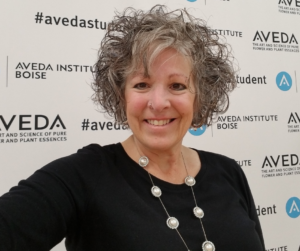 Patty shares one major piece of advice for anyone who is considering a future at Aveda Institute Boise: visit the school for yourself! You can read about the school online all you want or talk over the phone, but nothing gives you a better idea of the school than visiting it in person. The school directors, Patty and Tina, are licensed cosmetologists, so they can speak to the questions you may have about the education at both Aveda Institute Idaho campuses. They know what it takes to be successful in the industry, and they’re excited to share what they know with you! Not everyone makes up their mind right away about where they want their careers to go. 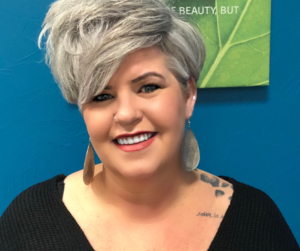 Tina Langdon, the director of the Aveda Institute Twin Falls, is an outstanding example of someone who decided they wanted to make a change and go to beauty school. She worked in the financial sector for 12 years before deciding that she wanted to work in beauty. She had always had a love for beauty, especially for hair color, so when she made the decision to change careers, she finally felt like she was doing what she loved! The road to becoming a professional cosmetologist wasn’t easy for Tina, however. Each time she tried to enroll she encountered problems with financial aid. She tried to make it work several times, but she didn’t really understand the process and it was extremely frustrating. Worst of all the financial aid staff she worked with at the school she had applied to were not knowledgeable about the process and she was left to figure it out on her own. That’s why Tina now has a passion and talent for helping people through the financial aid process! 1. We reach out to you by your preferred method and have a conversation over the phone. 2. Schedule a time to tour the school to see what it is like and to meet current students and staff. 3. Meet to review financial aid process and application paperwork. How are we prepared for the state board? How does this program help me earn my license? When do I have to repay my loans? Tina and Patty love helping students to learn, grow, and feel confident in their education, so they are available to help you every step of the way and address your questions! Tina’s advice to students is similar to Patty’s: come in and meet with her! Many people feel like the admissions process can be scary or difficult, especially when it comes to applying for financial aid. If you meet with Tina, the Free Application for Federal Student Aid (FAFSA®) application can be completed in as little as 5-10 minutes, which can save you a lot of time and stress. Tina likes to remind people that Aveda Institute is a cosmetology school run by cosmetologists, so pretty much everyone at the school has gone through what you might experience! With the help of Patty and Tina, you can pursue your dream of becoming a beauty professional! Aveda Institute Twin Falls and Boise are the places where you can get your start in something you are passionate about. We have programs that teach cosmetology, esthetics, and nail technology, as well as a program that can prepare cosmetology graduates to become educators. Don’t forget to ask about our lashes certification as well! Contact us today to learn more about how you can get started!